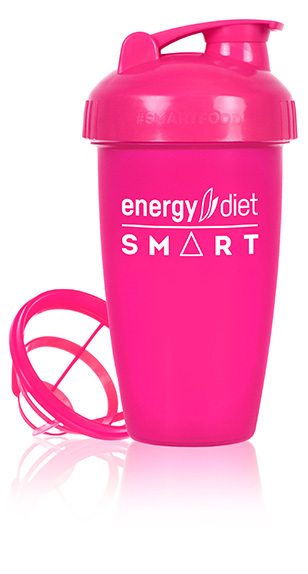 A trendy shaker cup with a flip cap for easy preparation of one serving of Energy Diet. With its bright and stylish design, you will always be in the spotlight. The convex measuring scale makes it easy to follow the recipe's precise amounts, and the spring-shaped mixer ensures your cocktail is lump-free and perfectly mixed. This bright shaker cup is indispensable for preparing your favorite Energy Diet drinks. The spring-shaped mixer inside the shaker cup lets you prepare a lump-free, homogeneous drink. The comfortable wide spout makes it easy to drink without any spills, and the flip cap ensures tight closure even during vigorous shaking. Now you can drink our shakes anywhere, whether on the-go or while driving. The measuring scale will make sure you have the precise proportions. Use it to make cold and hot ED and HD shakes. Just place the ingredients inside, tighten the lid and shake vigorously.